Well... lets start this thread! I never really used the eeveelutions in my team, because I'm perfectionist, and I just can't have a team without all 3 of them. Last edited by GhostPony750 on Sun Mar 03, 2013 4:36 pm, edited 1 time in total. I ended up with jolteon by random choice and I liked it. 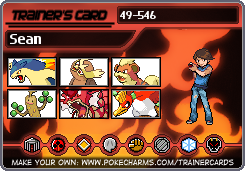 I had a pretty unbalanced team at the time and jolteon helped balance things out. ...Good one, dude. I, too, can name them all. I'm proud of you. I go with Flareon. 'Cause it's a fire type. And I really don't have a choice if I want a full fire team, which I do. But I like it, don't get me wrong! And I like Jolteon, too, just not as much as Flareon. I almost used a Vaporeon in my first go, but then I got Staryu to replace it. I really only used it for Surf.